Paul Goldschmidt carried the offense for the whole season in 2013 and also played stellar defense at first base for the DBacks. . He had a .302/.401/.952 triple-slash with 36 HRs and 125 RBIs – and this also included him having 332 Total Bases. He also led the National League in Extra-Base hits with 75 and was third in runs scored at 103. He finished 2nd in NL MVP Voting for his efforts. . In 2014, he has continued his assault on NL pitching, despite the club not faring as well. Heading into Sunday, he has a slash line of .324/.375/.571 – and leads the NL in GP (45) PA (202) AB (182) H (59) 2B (18) XBH (27) and TB (104) and is tied for 4th in HRs with 9. Paul Goldschmidt absolutely obliterated Dodgers Pitching on Saturday night, touching them up for 2 HRs, 2 – 2B, 6 RBI 5 Runs, Added 12 Total Bases, and even walked once for good measure. Goldschmidt also was the only MLB’er to smack 2 big flies yesterday. Furthermore he entered a logjam of players that are now tied for 4th place in the NL with Charlie Blackmon, Carlos Gomez, Brandon Belt, Justin Upton Adrian Gonzalez and Yasiel Puig. Speaking of Puig, he hit a HR for a 2nd straight game, and his 4th smash over the fence of the week. He finds himself back in the top 5 in several offensive categories. Troy Tulowitzki enjoyed home cooking again, with his 3 – 4 night, with his 12th HR to stay tied with other NL Leader Giancarlo Stanton. Both Jose Bautista and Brian Dozier did yard work yesterday, to draw themselves in a tie for 3rd place each with Nelson Cruz of the Baltimore Orioles. Last year Josh Reddick was struggling mightily early in the year before he crushed a 3 HR game and a 2 HR game versus the Toronto Blue Jays at SkyDome in 2 straight days. .The LHB is a streaky hitter, but he has yet to duplicate his sustained success in the 2012 year, where he mashed 32 HRs for the whole season. If you look at his 2014 Slash Line, it looks a lot alike last campaign. 2013 – .226/.307/.379 – with 12 HRs and 56 RBI in 385 AB. HIs 2014 #s now are .236/.297/.386 – with 4 HRs and 18 RBI, which is just about a 1/3rd of the totals pace from last year in a 1/3rd of the Games Played..
Josh Reddick has broken out of his slump and pasted the ball over the last 3 games. His Grand Slam and 2 run HR effort last night, coupled with his HR a few nights ago, now give him 3 HRs on the year. Reddick must continue his assault on pitching, as the team just picked up Kyle Blanks, and they are already armed with Coco Crisp, Yoenis Cespedes, Craig Gentry and Brandon Moss, all rotating through OF/DH/1B. While Moss will see more action at the First Base Position, likely in a platoon with Blanks, both have capable ability to play RF like him. Still for one night, it was good to see him rake the ball again, and all the Oakland fans are now bringing back the song ” Careless Whisper” by Wham, as it is the slugger’s walkup song. 2014’s Top Home Run Hitters In The MLB: HR Streaks (3 Active): (Donaldson, Cruz, Morse) + EE IS Mashing! Encarnacion has put together back to back great seasons in the middle of the Jays lineup, bashing out 42 HRs in 2012, and then knocking out another 36 in 2013. At just a contract extension of 3 YRs/$29 MIL for 2014 – 2016, the Jays MGMT can be happy with the sluggers value. EE started off slow in April with just one HR, although he has exploded for 7 in May already, and he has vaulted into the RBI race with 30 knocked in as well. Encarnacion is third in the Majors In HRs since the start of the 2012 season. Last night, he had his 2nd 2 HR game in 8 days. EE also has a 3 game HR streak this month as well. Edwin Encarnacion had his 2nd Multi HR game of May already, and now after a slow start, has clubbed 8 HRs and added 30 RBI for the year. Double EE has been one of the most consistent HR hitters in the MLB from the start of the 2012 campaign, as he trails only Miguel Cabrera (94 HRs) and Chris Davis (88 HRs) – with hit total tally of 86 Homers in that time frame. 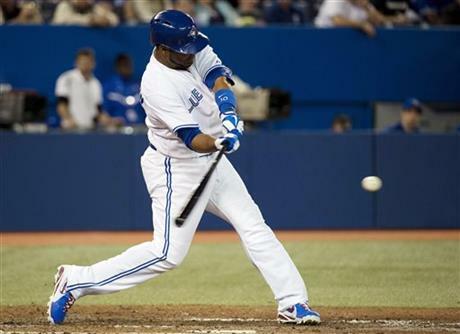 Encarnacion hit 42 HRs in 2012, and nailed 36 of them last season. In addition to his 2 Multi HR games, he also had HRs in 3 straight games earlier in this month. Juan Francisco and he are carrying the club, with teams seemingly pitching around Jose Bautista. Francisco himself as done yard work 7 times in just 82 AB this year. The new Blue Jays 3B has given them an infusion of offense. It is kind of weird that the Brewers gave up on him – after this 27 Year Old, (who can play 1B/3B and PH) cracked 13 HRs and 32 RBI in his 240 AB for the 2013 Year. The Brew Crew opted for Mark Reynolds, who was more expensive, but could potentially draw more walks. Both of them strike out a ton. Anyways, Francisco had hit 20 HRs and added 50 RBI in his last 322 AB in the big leagues. This will suit the Canadian franchise just fine, even if his whiff rate his high. It is funny how names continue to pop out within this organization. There was Juan Encarnacion, then Edwin Encarnacion. Then you have Frank Francisco, Ben Francisco – and now Juan Francisco, which is a mix for Ben Francisco and Juan Encarnacion. Of course they already have two Jose’s in Bautista and Reyes, and they also had Perez’s last year. David Ortiz not only hit jacks in 2 consecutive games, the ALL – Time DH HR leader hit 2 of them, in both Tuesday and Wednesday’s game. For his efforts, he has tied for 2nd in AL HRs. The man keeps on ticking even at the age of 38. Nelson Cruz blasted a shot that almost brought the O’s back in a game they trailed the Tigers 6 – 0. The O’s may have lost 7 – 5, but they continue to receive great play from this man. Cruz was a bargain basement deal at 1 YR/$8 MIL, for a guy who is currently on pace to smash over 40 HRs, and drive in well over 120 RBI. Brandon Moss continued to raise his stock in the realms of the power hitting players pantheon Tuesday by doing yard work twice. 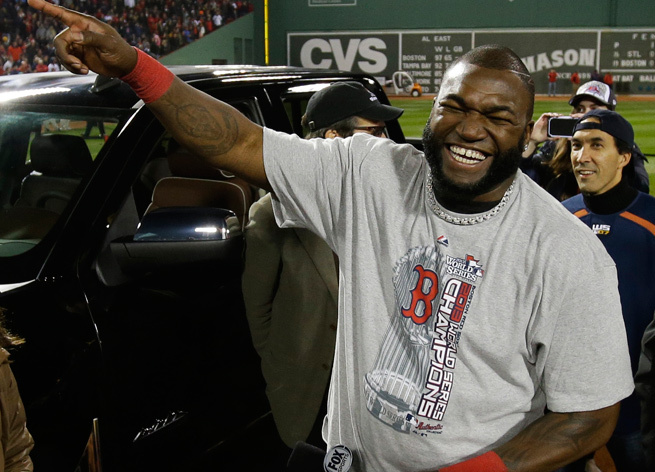 David Ortiz did all he could to help Boston win with a 2 HR effort. There you go, looking at his year numbers for 2014, as they bare resemblance to his career 3 Slash. The only active MLB’er to carry HRs in consecutive games this day is Mets OF Curtis Granderson. This fine gentlemen showed the New York fans what they are missing, as he has clubbed shots over the wall in back to back games. Granderson had back to back 40+ HR campaigns with the Bronx Bombers, and will always be compared to Carlos Beltran in the next 3 years. They both have 5 HRs – and Granderson has 4 more RBI, while Beltran has better averages. Beltran is also hurt now with a bone spur. The Yankes felt his postseason pedigree was the deciding factor of signing him over Granderson. Both Ortiz and Victor Martinez climbed into the top 5 in HRs last evening. There were a lot of HRs hit for how few games there were on a shortened Monday schedule last evening. 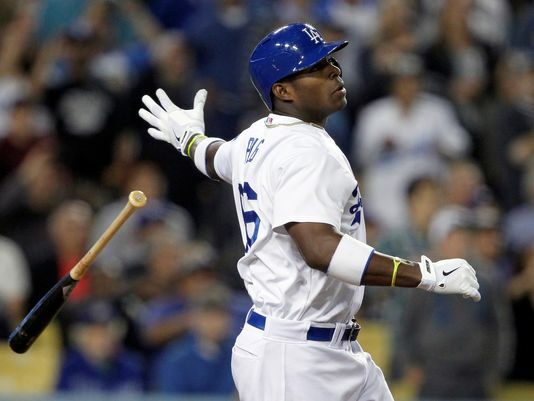 Yasiel Puig hit a mammoth HR to erase a 2 run deficit into a lead. 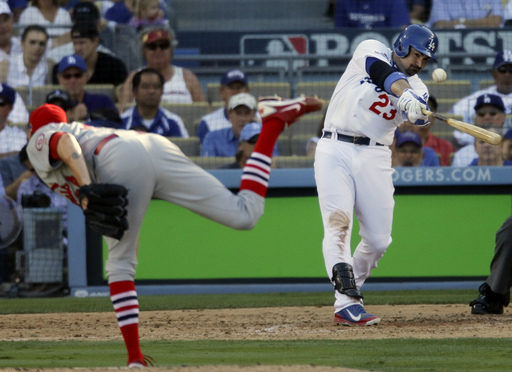 The 2nd Year Dodger is on fire right now, and has hit back to back HRs in the last few games. After a slower start, the 23 Year Old is now resembling the player he was last year, featuring a .318/.408/.551 3 Slash Line for the campaign – with 7 HRs and 29 RBI. For the 3rd straight weekend, Mark Teixeira has hit HRs in back to back games. He has begun his 2014 season with power we haven’t seen from him in a few years. Tex has 7 HRs in just 79 AB – with having knocked in 16 RBI. He is on pace to crack about 40 HRs and add about 100 RBI. Don’t think he will maintain that pace, but a 25 – 30 HRs campaign, with 80 RBI is not out of the question. 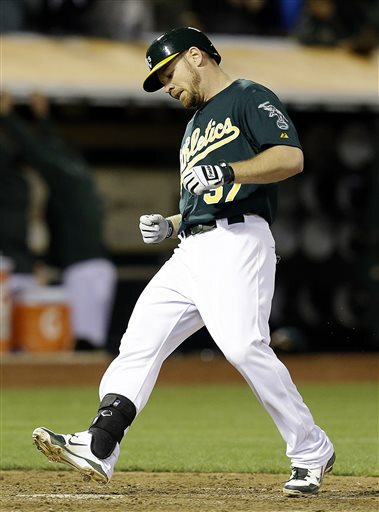 Yesterday, Derek Norris hit 2 HRs to lift the A’s to a sweep over the Nationals. He also had back to back games of HRs early last month, and is featuring an OPS of nearly 1.100. John Jaso, he is Catching tandem partner, had back to back games with dingers over the weekend. Dustin Ackley hit HRs in both Saturday and Sunday games to put himself on our board of HRs. On Sunday, the guy clobbered two balls over the wall to give him 4 on the year. Joey Votto, Troy Tulowitzki and Mark Teixeira all have been hit big HRs over the last 20 calendar days, all featuring 3 different stints, where they carried HR streak of 2 or more games. Victor Martinez is also creeping up on the leaderboard with his recent power surge. The 2012 and 2013 AL MVP finally is putting it all together. 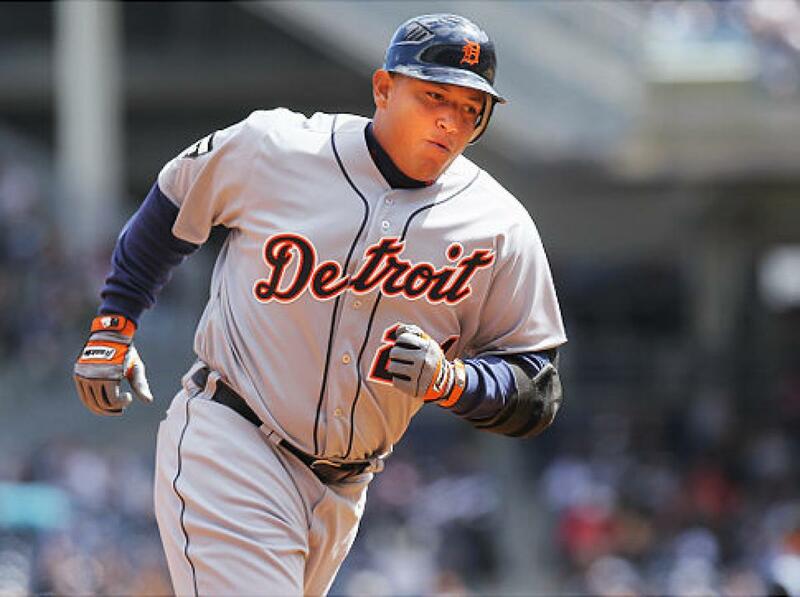 Miguel Cabrera has helped bash Detroit to an 8 game wining streak, and has finally hit HRs in back to back games.After hitting for a decent average for a few weeks, the 31 Year Old 1B has been racking up RBI, and is adding power back to his repertoire. Miggy now has 25 RBI in 29 Games Played despite just cranking 4 HRs. But this writer feels a hot HRs streak coming from the RHB. Cabrera is coming off back to back 44 HR campaigns. I picked him to lead the AL and Giancarlo Stanton to lead tie him for the most in the MLB with 49 each. I think the guy could still do it. He blasted 44 HRs last year, when he couldn’t even hit for power during the last 6 weeks of 2013. Also effectively off the snide is Adrian Beltre, who clubbed a Round Tripper in the last 2 games the Rockies have obliterated the Rangers. It may come as little solace to the now 17 – 17 Texas team, but your Silver Slugger 3B is starting to mash. Giancarlo Stanton is healthy, motivated and when he is on, no ballparks can hold his behemoth blasts. Of his 10 HRs, 9 of them have traveled further than 400 Feet. 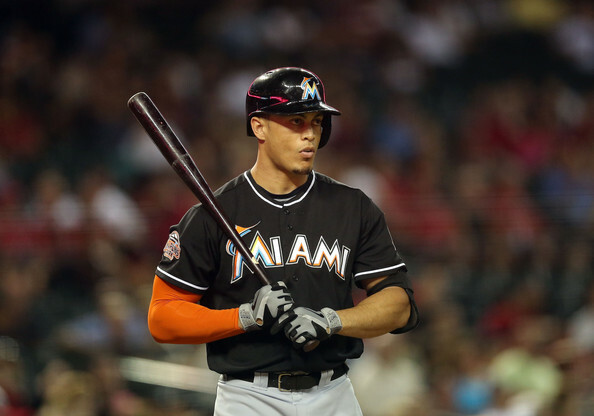 In the young season, Stanton leads the NL with HRs (10), the Majors with RBI (36) and Total Bases (NL – 74). The 24 Year Old from Panorama, CA has Slashed .285/.362/.603 – and is a major reason why the Marlins are just a game and a half behind the NL Division Leading Braves. It was quite the day yesterday for the Tater Trots in the MLB. Giancarlo Stanton hit 2 big thunderous HRs – to take sole possession of the NL HR lead, in carrying his team to a series win versus the Dodgers, and the Marlins are now 14 – 5 at New Marlins Ball Park this year. George Kottaras came off the scrap heap to paste 2 shots over the fence. These HRs represented the only two big flies of the year for the Catcher. Brandon Crawford hit 2 HRs in the GIants sweep of the Atlanta Braves. Where Pablo Sandoval has failed for power so far, the INF tandem of “Team Brandon, Belt, Hicks and Crawford” have combined for 16 HRs in 277 AB from the 1B/2B and 3B. When you throw in Buster Posey‘s totals, then it is 23 HRs in 382 AB. “Kung Fu” 3B needs to get off the snide in his contract year. Wil Myers continues his ownership of the Yankees, with an Inside The Park 3 run HR, and adding an RBI Double – keying a 5 -1 win over the Bronx Bombers and CC Sabathia, clinching the series 2/3. It was the 2nd straight game in which Myers did some yard work, and he also had a 2 HR game against the Pinstripers on Apr.19.. Read a Captioned picture at the end of this article to see his prowess over the Yanks thus far in his short career. Jonathan Villar of the Houston Astros hit a HR for the 2nd straight contest. Desmond Jennings was counted on to fill the void left by B.J. Upton when he took over the CF position in 2013. It wasn’t a banner year – although he still stole 20 bags and scored 82 Runs – with a .748 OPs.. With him hitting a HR for the 2nd straight game in a 10 – 5 14 Inning marathon tilt versus the Yankees, it vaulted the Rays to a 3 game winning Streak. 2014 has been a kinder campaign to the 27 Year Old originally from Birmingham, AL – as he has slashed .277/.378/.463 – with 16 Walks, 6 SB and 16 Runs Scored in his 28 Games Played. That is great production for the 5 year Veteran. Last night we had a nice complement of big flies – so that we have 6 streaks active going into today’s play. There is one Carlos Gonzalez who is still active on his HR streak, but is out of the Rox lineup. We have not had a multiple HR game since last Sunday when Jhonny Peralta went yard twice. That Cards SS went deep last night, joining Mike Morse, and a bevy of other NL hitters tied for 5th place with 7 HRs. The Braves had themselves a weird 3 game set in Miami, where they lost 3 games, gave up 23 runs, and have accused the Marlins of stealing signs for pitches. 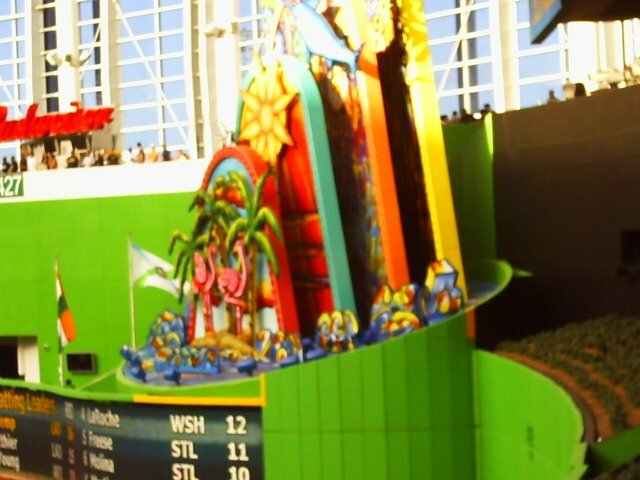 I love how the Home Run monstrosity in CF may be the culprit of sending the secret codes out to the hitters. Miami has added several (3TO guys this year like Garrett Jones and Jarrod Saltalamacchia.) 3TO stands for 3 True Outs, either via a BB/SO or you round the Bases without having the ball touch the field inside the playing surface. Home Run Leaders In 2014, HR Streaks (3 Active) + Multi HR Games: Tulo Keeps On Fire – Stanton Ties For NL Lead! Giancarlo Stanton tied the NL For the lead with 8 HRs yesterday, when he went deep in the Marlins 9 – 0 romp of the Atlanta Braves. Stanton also leads the NL in RBI with 32. He is one of each a HR and an RBI behind Jose Abreu for the MLB lead. 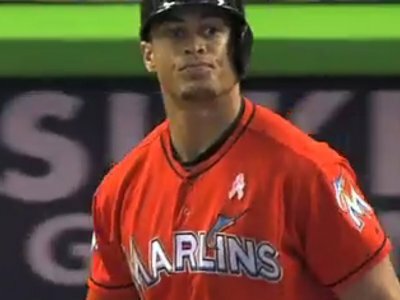 Is this the year Stanton finally reaches projections? The MLB Reports picked him to lead the MLB in HRs all the way back in FEB of this year. Troy Tulowitzki is on fire. He homered for the 2nd consecutive game, and is now just 1 Roundtrip behind Giancarlo Stanton and Adrian Gonzalez for the NL Lead. TULO is also tied with teammate Justin Morneau, for third in RBI this season at 22. His efforts help the Rockies win last night in Arizona, and the club is now 16 – 12 on the young season, just 0.5 Games behind the Giants. Mark Teixeira hit a HR for the second straight contest, and has now clubbed 3 HRs in the week he has been back from injury. While the rest of the teams pitching is struggling or be hurt outside of Masahiro Tanaka, having the 1B hitting like this bodes well for the lineup. 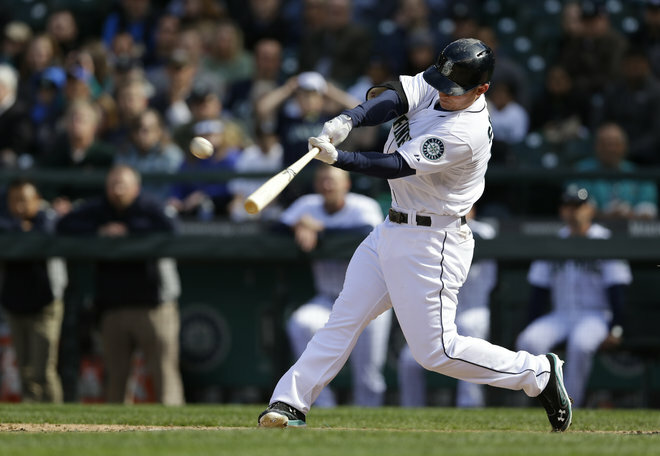 Heading into play last Thursday night, fantasy players and everyone surrounding the Mariners was wondering what had happened to 3B Kyle Seager? He has since nailed 5 HRs in his last 4 games, and is now hitting for a .798 OPS – with 13 RBI in 79 AB on the young season. The last 2 years, Seager has hit 20 and 22 HRs respectively – and been the only player on the squad to have decent RBI totals. With only 6 games being played last night, there were not too many HRs hit for the contests. This has left the MLB with 2 current players with HR streaks. Those players both have clubbed HRs in back to back games, and they are Giants SS Brandon Hicks and Seattle Mariners 3B Kyle Seager, who hit 3 HRs over the Saturday and Sunday games – and has 5 Tater-Trots in the last 4 games. Seager had exactly zero Home Runs, before squaring 2 baseballs up last Thursday at home versus the Houston Astros, He was blanked by the Rangers on Friday, before doing yard work on Saturday. On a team that has desperately be in need of offense – due to early season woes from Yasiel Puig, Matt Kemp, Andre Ethier and Hanley Ramirez, A – Gon has delivered the goods. Yesterday, he hit a HR for the 3rd straight game, and today he has a chance to match the 4 HR streak he already put up earlier in the Month. The Dodgers 1B is showing signs of his early career power prowess. He is currently 3 Slashing .309/.362/.639 – with 8 HRs and 22 RBI in his 1st 18 Games Played. LA has managed to stick in the NL West race, with a 14 -11 clip thus far, I can’t imagine where they would be with such a hot start from Gonzalez. Early season power surges are quite common the MLB. I mean everyone remember Chris Shelton jumping out of the box with 9 HRs, and also remember Tuffy Rhodes clubbing 3 HRs on Opening Day one year against Dwight Gooden. The key is parlaying a fast start into some sustainable durability. Brandon Belt, Brian Dozier are unlikely HR leaders right now, and a lot of people must wonder if Jose Abreu can keep up this kind of pace. Bautista, Trumbo, Pujols and Stanton had to be penciled in for a lot of HR leaders by experts, fantasy players and scouts alike. Josh Donaldson has also turned it an, clubbing 7 HRs in the last 15 calendar days, and is looking more like the player that finished 4th in AL MVP balloting. Chris Colabello is the most unlikely early RBI leader in the AL, with 26 knocked in during his 1st 20 Games Played this year. While he is leading the AL in Doubles with 9, he has now added HRs in back to back games. The Team Italy player for the last WBC tournament has been hitting in the middle of the lineup for the 10 – 10 Minnesota Twins. The RHB originally from Framington, MA came into the 2013 season with just 160 AB last year (his rookie campaign in the MLB). So far in 2014, he has 3 Slashed .346/.386/.577 – and has played 1B/RF and DH. It was a great night for Tater Trot’s yesterday. The Giants had teammates crack 2 HRs each in Morse and Sanchez, while Blackmon extended his consecutive HR games streak to 3, and Tulowitzki clubbed a big fly for the 2nd straight contest. 2 men (McCutchen and Blackmon enter play today with 3 games straight with a HR. 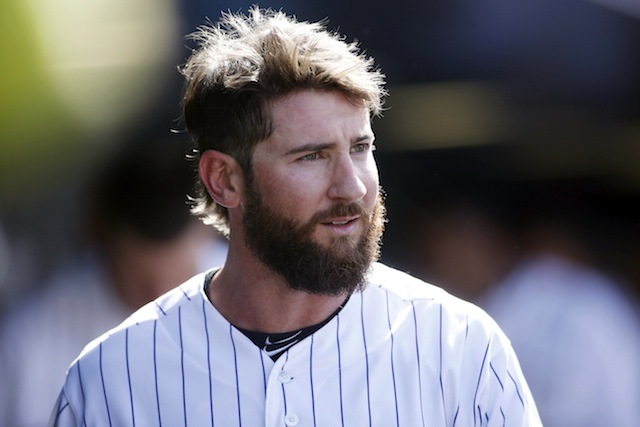 The 2013 NL MVP will try to extend his mark versus Tony Cingrani of the Reds in a Thursday afternoon game at PNC Park – while Blackmon will travel to LA – trying to extend his streak versus Josh Beckett tomorrow night. Kyle Seager, of the Mariners, and Hector Santiago of the Giants, hit their 1st 2 HRs of the year, in Multi HR efforts Wednesday. Albert Pujols has fought back from his injury in 2013, to lead the Majors in HRs (8) – including 2 big bombs last night in Washington. His 2nd smash, was the 500th of his career, joining 25 other men who have accomplished the feat. 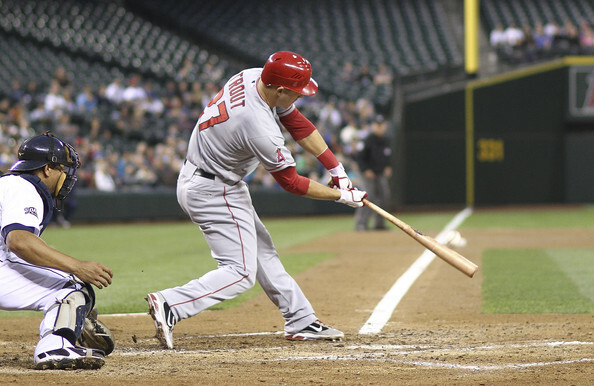 The Angels squared their season record at 10 – 10, and are 7 – 4 away from Los Angeles. 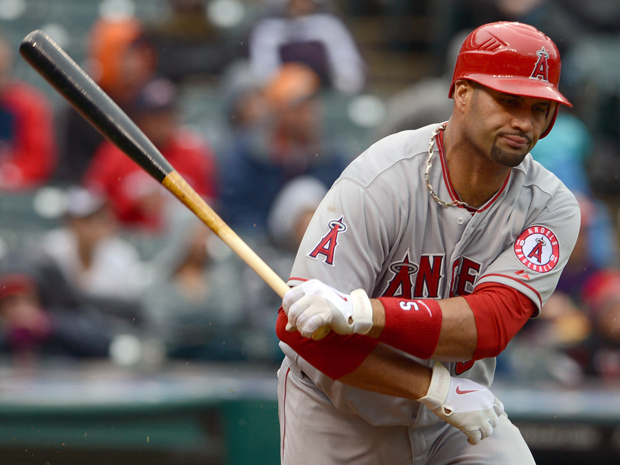 Pujols became the 3rd youngest MLB’ER to this feat – as only Alex Rodriguez and Ken Griffey JR. were younger. Charlie Blackmon continued his assault on NL Pitching yesterday with a pair of HRs. They represented the second straight game he has clubbed a Tater – Trot, and for that he found himself on our Multi HR board and consecutive leader for 2 games right now. The 27 Year Old OF has fashioned a 3 Slash in 2014 of .411/.450/.671 – with 4 HRs and 13 RBI. He leads the NL in: BA, Hits (30), TB (39) – and slugging. Blackmon has played at least 4 games in every position beyond the grass this campaign, and is making the fans not miss Dexter Fowler. So far in 2014 we have some of our usual candidates holding down front and center with the HR race. Jose Bautista is back to his old leading ways in Toronto, and Albert Pujols has re-emerged as a legitimate threat to circle the bases. 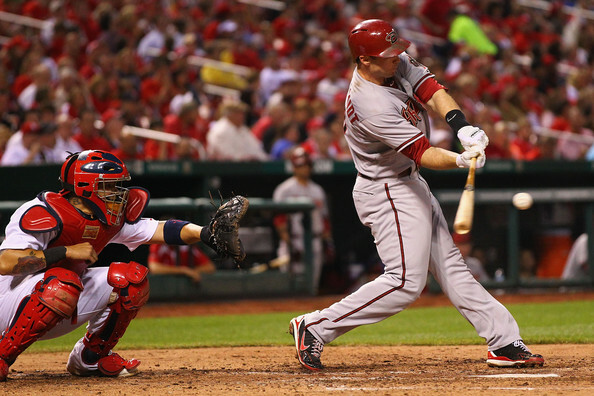 In the NL, Mark Trumbo broke a horrendous slump – to paste a big fly (#7) in yesterdays game. Unfortunately, it came in another D’Backs loss. Pedro Alvarez (who tied for the NL Lead with Paul Goldschmidt in 2013) is right behind him with a pack of 5 sluggers at 6 jacks. Ryan Braun and Albert Pujols are on the leaderboard because of torrid stretches. Pujols has had 3 back to back HR games, and Braun has smacked his 6 HRs in just 3 games of play. 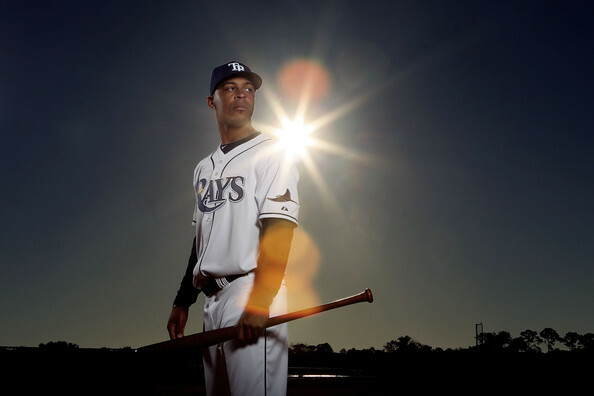 Carlos Gomez had a breakout season in 2013 with a career high 40 SB. Gomez added 61 Extra Base Hits, his 1st ALL – Star Game and brought home his 1st Gold Glove Award for CF. 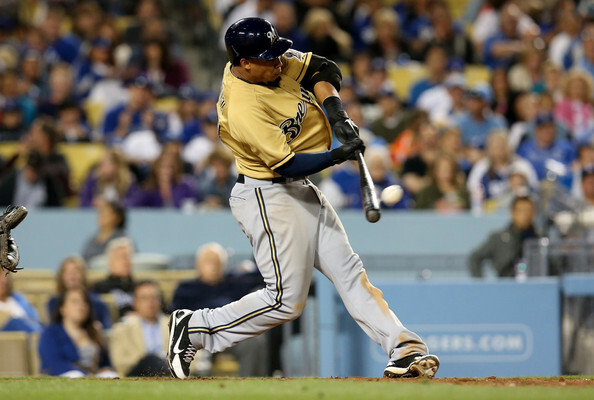 ” Carlos Gomez, 28, had a breakout season in 2013 with a career high 40 SB. Gomez added 61 Extra Base Hits, his 1st ALL – Star Game and brought home his 1st Gold Glove Award for CF – and also was among players who had 20 HRs and 20 SB . So far he is tied for 5th in the NL with 5 HRs, but only has 1 SB heading into action today. Here at the MLB Reports we look to do things different. It is one of our many motto’s. We simply can’t look over every stat, or even chart every HR for that matter, but I have decided that we will carry the top 5 HR hitters for each the AL and NL on a page we have dubbed Stats.